Thanks for the info Mike and yes please keep us informed on your experiments. I haven't played with the ratio going the other way so now I'm going to experiment as well. 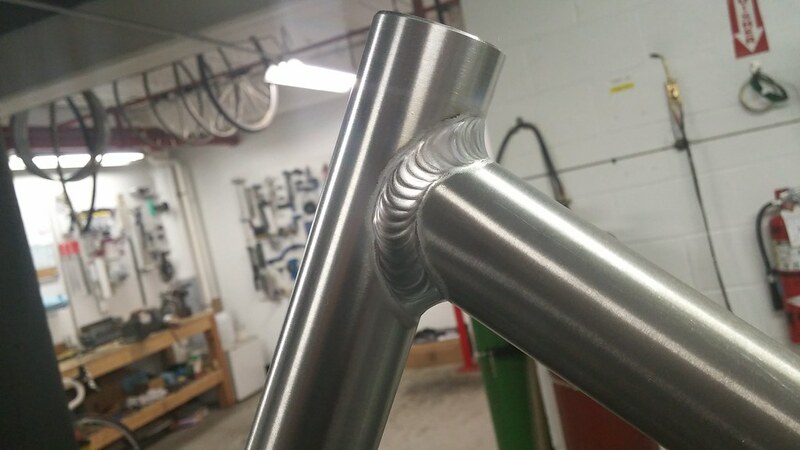 solid slick welds on the frame. the 280DX is like how you say...so much more tweaking than just manufactures recommended settings. The parameter choices seem endless on the Dynasty 280 DX, and I love IT! Still practicing, starting with Pro-set features till I figure it all out. My question: can you weld Alum. 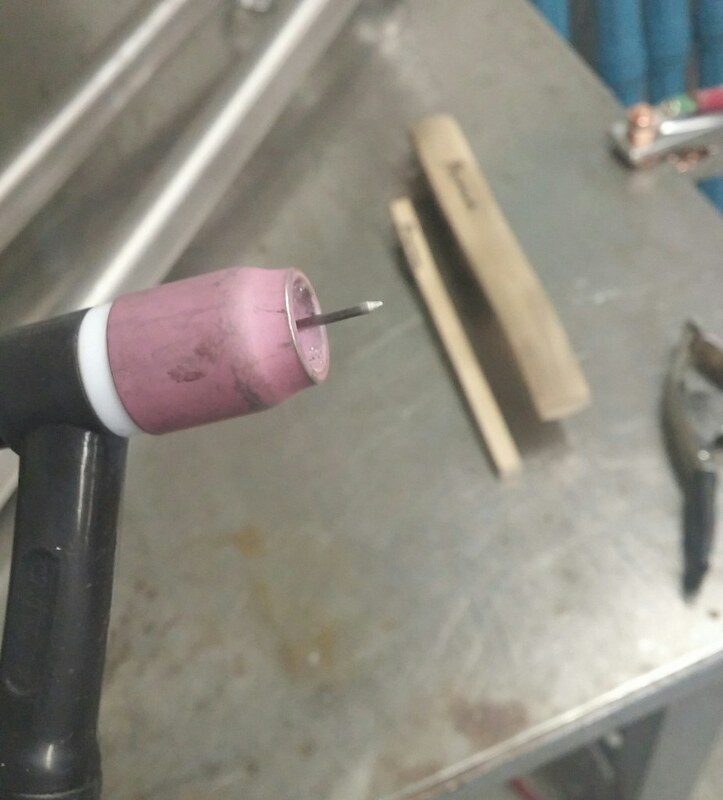 with the Pluser ON ? and what if any benefit? The Owners Man. (sec 15.2) mentions PPS lower settings for helping with Porosity on alum. and the Background amps set between 35--50%. I am just a little unclear, (haven't tried it yet) I thought when I used my syncro. Pulser it was a DC tig function only. I am a 30 year welding Novice, Practicing a lot, trying to improve. You bet. You can run pulse on AC. In my experience though, it is generally only helpful for timing. I have used it a few times for very thin (<0.020") applications to keep the heat from getting out of control. But I do those same joints now with straight AC current. I really like high speed DC pulse though. It gives me a little more control on edges and I can generally travel faster. All that said, experiment! Figure out what works best for you. That's the beauty of it. The pro set settings are a great place to start when you try the pulser. Work your way from their and take notes. Have fun with your new machine! Keep us posted on your findings. 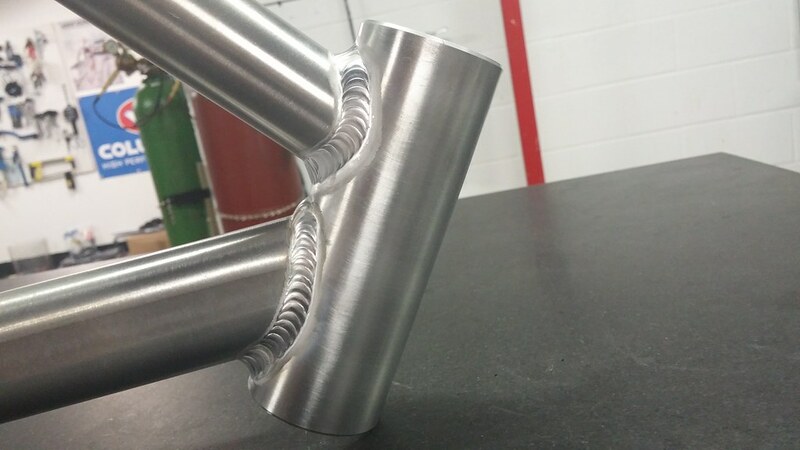 Thanks Mike, I will do that, my ultimate goal is to get my welds looking like yours on that bike frame, awesome work. Tungsten after welding out the front triangles. Now granted, this isn't a ton of welding. But I think it help up amazingly well. For reference, the head tube is 2" OD x 0.145" wall. 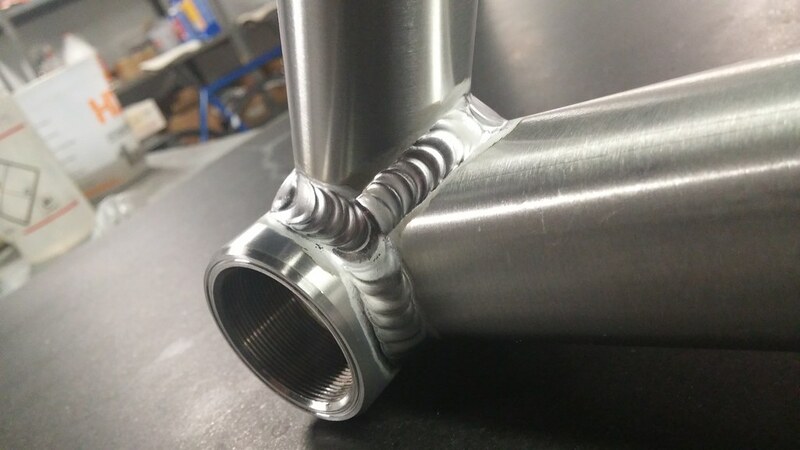 The threaded bottom bracket shell is 1.75" OD by 0.160" wall. The three main tubes vary between 0.052" and 0.074" wall. Material is 7005 aluminum. Filler was 5183. If you've made it this far, I hope you found the info useful. I'm going to keep experimenting with wave shape and I'll put up more info if people are interested. I keep coming back to what Dave Powelson has typed quite a few times. There are an infinite number of ways to set up these inverters. I'll add to not get boxed in by the recommendations. Experiment a lot! I have had my Dynasty 350 now about a year and a half welding and repairing mostly aluminum heads and engine blocks,but recently started fabricating a sprint car fuel injection intake manifold trying to get the nice welds like your's and have been doing a lot of experimenting to get really good looking welds, and started doing exactly what your doing and i am getting the same results,i'm still dialing things in and like the results,welding 6061,.065 to .250 using 4943 filler. Question? I have an opportunity to buy a 2005 dynasty 300 for good price,or should i wait and buy the dynasty 280 for $5000. more,with 3 yr warranty. I would go with the new Dyn 280.... remember the 3year warrantee on a new machine...it could mean a lot..
Last edited by H80N; 11-22-2015, 06:35 PM. foolwelding what did you buy ? Last edited by H80N; 12-31-2015, 06:16 AM.